Home >> Lactation Center >> Carrie McClure, R.N. 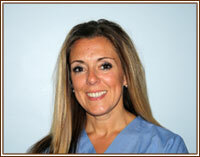 Carrie McClure, RN, BSN, CLS, is a native of West Virginia. She received her Bachelor of Science degree in Nursing in 2001. Carrie came to South Charleston Pediatrics in 2009 after caring for newborns and their families for many years in the hospital, home, and private practice settings. Her rewarding personal and professional lactation experiences over the years encouraged her ongoing education in lactation. In 2002, she became certified as a Lactation Counselor and in 2009 became a Certified Lactation Specialist through the Lactation Education Consultants (LEC) with emphasis on the practical aspects of lactation management. Carrie is passionate about helping nursing mothers meet their breastfeeding goals. Carrie’s professional organizational involvement includes the National Association of Neonatal Nurses and the Society of Pediatric Nurses. Carrie is happily married to her husband, Mike, and has a beautiful son named Will. She enjoys spending time with her family and watching her son play sports. She loves to travel and is very involved in the community and volunteers frequently at her son’s elementary school. Additionally, Carrie is an exercise enthusiast and recently accomplished a personal goal by competing in a triathlon with her co-workers.